Ocean acidification is invisible to the naked eye. It’s not something we can smell, not something we can feel with our fingers. But in many parts of the world, that’s just how fishermen and shellfish farmers assess the water they work in. Right now, the methods we have to understand and respond to ocean acidification are expensive, requiring a lot of equipment. For example, oyster farmers in the Pacific Northwest rely on ocean monitoring systems that tell them the condition of the water, high-tech hatcheries that give them a controlled environment in which to rear their oysters, and buffering systems that allow them to neutralize the water coming in and make it suitable for oyster growth. For shellfish farmers who are worried about making a profit at the end of the day, it can be impossible to foot the bill for expensive technologies like these. That’s where government support comes in. The oyster farmers of Oregon and Washington State were able to build their defenses against ocean acidification with help from the federal government, which directed half a million dollars to the development of these monitoring and adaptation systems. In many places I visited, however, government support was limited and these important technologies were nowhere to be found. In Ban Don Bay, the hub of shellfish farming in Thailand, I sat on a wooden long-tail boat at peak clam harvesting hours: 1 – 4 am. Why the middle of the night? Because that’s when the tide is low enough to dredge the mud flats by hand. A young man single-handedly hauled a steel cage up onto the boat, dumping out the clams that had been dredged from the farmed-flats below. He threw the empty cage overboard, while an older man steered the boat ahead. The cage dragged along the bottom for a few minutes until the young man tugged on the rope again to haul the harvests on board. Thousands of shellfish farmers work the mudflats of Ban Don Bay. But they rely entirely on natural seed, having no hatchery to supply them. Many farmers told me of how they had observed changes in the water—an increase in algal blooms, changes in the smell and color of the water—but they didn’t understand these changes, and had no way of knowing what caused them. Jintana Nugranad, a Senior Fisheries Biologist working within the Thai Government, told me of how she had fought to maintain a shellfish hatchery and expand monitoring efforts to support the industry in Thailand through scientific research on shellfish and seed production, but received no support in her efforts. This was the case for much of the scallop industry in Peru as well. Farmers collect natural seed from an island near Sechura Bay. There are a few privately-operated hatcheries in the bay, but so far none of them have equipment to monitor the chemistry of their intake water, or to modify the chemistry of that water if it proves too acidic for their scallops to grow. 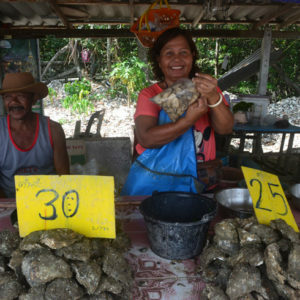 Scallop farmers were hopeful, however, that the government and private sector would support the development of hatcheries throughout the country. In Hong Kong, oyster farmers told me how they hope for similar support from their government. They work in Lau Fau Shan, in the Northwest corner of Hong Kong’s New Territories. The region is famous for its oysters, and the only place in Hong Kong where oysters are still grown. One of the farmers, Mr. Chan, explained to me that the hyper-capitalist structure of Hong Kong means there is little support or services provided for primary industries like his. He pointed to China, just across the bay, and told me of how shellfish farmers there receive government support to invest in advanced technology. But in Hong Kong, he told me, “e He pointed The way we farm oysters is very backwards. We rely on traditional knowledge that has been handed down for maybe 2,000 years. It is not scientifically advanced.” He told me of how they use the moon to time their farming activities and smell the water to determine its quality. Given how many environmental pressures these shellfish farmers face, ranging from industrial and agricultural runoff to changes in temperature and frequency of algal blooms, it’s remarkable that they have been able to survive in the industry. But ocean acidification is a powerful and complex threat. It cannot be seen without the help of technology, and it affects every drop of water surrounding these shellfish. Without access to monitoring equipment to determine what is happening and where, and with limited resources and access to technology that may allow for adaptation, it will be very difficult for these shellfish industries to survive. It is therefore critical that we expand research efforts to improve our understanding of ocean acidification as well as our methods for addressing it. This is exactly what NOAA’s Ocean Acidification Program is doing, but the program needs more funding to accomplish its goals. Support our petition to increase funding for NOAA’s Ocean Acidification Program.